Fellow Car cleaning | Hpp Europe - Puhtautta ja suojaa elämän tarpeisiin. Effective wipe series for maintaining all the surfaces of your car and giving those final finishing touches! 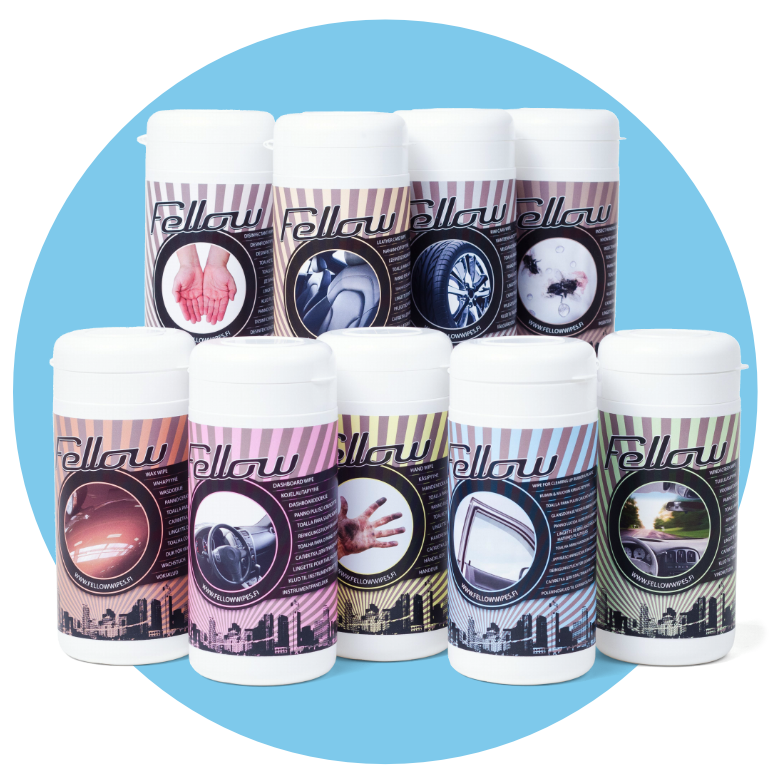 The Fellow product family features nine different cans for different uses. One Fellow wipe can contains 20 wipes with detergent. Thanks to the unique package, the wipes are ready to use even six months after opening the package. For cleaning the dashboard of stains and dust. 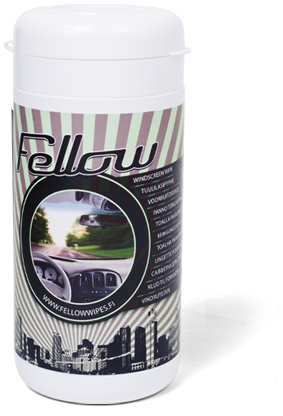 Fellow dashboard wipes are suitable for all surface materials and do not contain silicone. The dashboard wipes should not be used for cleaning the steering wheel. 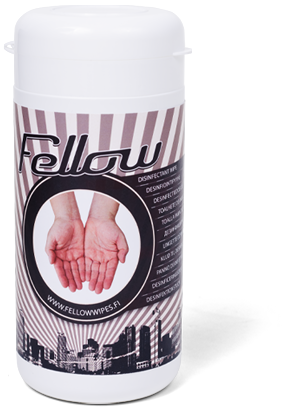 The Fellow disinfectant wipe is perfect for cleaning skin and for situations requiring good hand hygiene. The wipe effectively reduces the risk of bacterial infections. The wipe is also perfect for disinfecting surfaces and objects. The cleansing hand wipes are good to have around even outside the car. These wipes effectively clean even difficult to remove dirt from hands and significantly reduces the risk of bacterial infections caused, for example, by scratches in the hands. 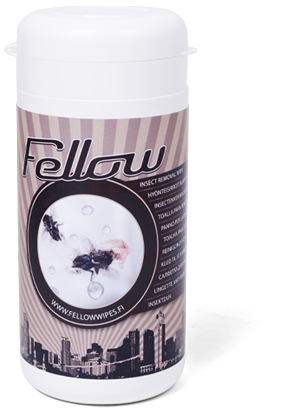 The Fellow insect removal wipe removes dried remains of insects from the windscreen, glass surfaces of sealed beam lamps as well as from painted surfaces. Wipe the surfaces before washing the car to soften and remove the insects. These wipes are not to be used for hot surfaces or in direct sunlight in temperatures over 30 degrees Celsius. 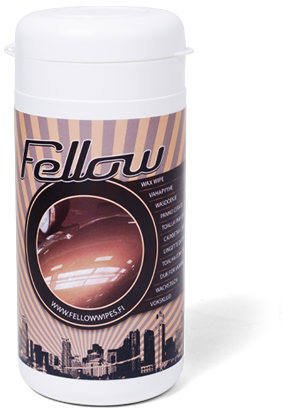 The Fellow leather care wipe cleans and maintains all leather surfaces in your car. The detergent in the wipe helps remove all fixed and difficult to remove dirt from leather surfaces. Used regularly, it helps keep the leather soft and as good as new. An effortless way to protect chrome and aluminium rims. 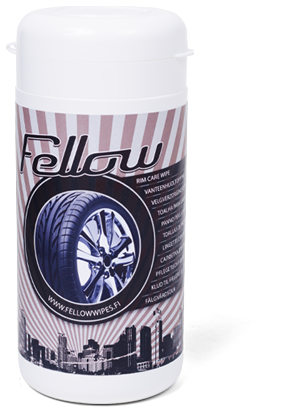 The Fellow rim care wipe prevents bitumen, brake dust and other dirt from sticking to the rim by creating a dirt-resistant surface, which lasts about three months. During the three-month period, wash the rims lightly with shampoo and rinse with water. Waxing could not get any easier! When your car needs a shiny and clean surface quickly, there is nothing like the Fellow wax wipe. Wash your car carefully, dry it lightly and wax it using the wipe. For wiping car windows from the inside. 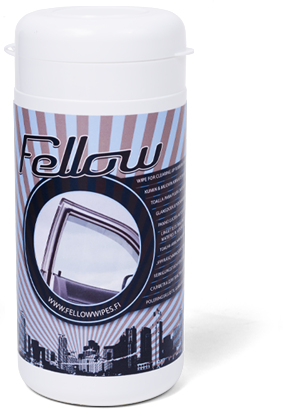 Fellow windscreen wipes remove dust, fingerprints, stains and the reflective surface created by fans without leaving any lint behind. The wipes turn your windows clear gently and without damaging the surface of the glass. Cleans and maintains plastic and rubber parts and gaskets inside the car, making them shine and returning them to their original colour. The rubber and plastic wipe should not be used for cleaning the steering wheel.